“Feedback Studio Köln 1.” Johannes FRITSCH: Flute Klang (1981); Kyo-Mu (1982); Noël für drei Flöten (1990); VIII ’94 (1994). Natalja Psenitsnikova (fl). Cybele CD 960 301 (1 CD) (https://www.cybele.de/). 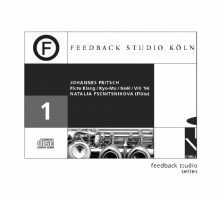 Psenitsnikova takes us through four varied pieces, three requiring tape or tape delay, from Fritsch (1941-2010) who founded the Feedback Studio in Cologne. At nearly half an hour, Kyo-Mu for alto flute (originally shakuhachi) and tape is the longest and most impressive contribution. The tape with veiled sounds of city life opposes the slowly flowing flute which flirts with Eastern gestures. Despite the meditative aura enriched with repetitive tapping (perhaps a metal rod striking a prayer bowl), the tape becomes aggressive at its center. There are majestic moments when the flute sustains over a changing tape. Flute Klang asks for a delay system. Noël requires three different flutes (the standard concert flute plus alto and bass) working together to create slow oscillating chords, here realized by one player and tapes. Both set repeating flute tones in motion to envelop the listener. VIII ’94 is for alto flute and temple block. It’s not clear how this ten-minute work is actually played as no indication of tape is given. Quite possibly the flute player is able to strike the temple block while playing, although on this recording, there’s also what sounds like dripping water and a bell. James ERBER: Flourish (1986); The “Traces” Cycle (1991-2006); A Small Revelation (2012); ein andrer Hauch* (2012). Matteo Cesari (fl, picc*). Convivium Records CR020 (1 CD) (http://conviviumrecords.co.uk/). Consistent in timbre across its range, the flute may be the ideal instrument for complex arrangements of pitch and rhythm. 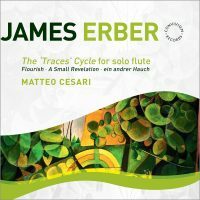 Traces is a mammoth hour-long three-part opus for solo flute (20:06, 17:57, 22:17). Everything about it suggests mediated conflict: A profusion of notes which eventually slows is balanced against a gradual but insistent introduction of different registers and volumes. Noting these gradual changes is one way to get into the material. I approach it as one might watch the leaves rustling on a tree: focusing alternately on leaves, or branches, or the space behind the leaves, or how leaves and branches pass through the same space as the wind blows. Despite the apparent years between parts, each segment does not appear to be arbitrary. The first part, Traces, seems the most frenetic even as gradually contrasting material in different registers makes its presence known. In Traces B clicks and key sounds appear more often; pauses surprise in Traces C. The series closes wistfully as if unwilling to let go. Cesari embraces the virtuosic triptych calmly. In the first part there’s a lengthy passage where frenetic high notes alternate with quiet low ones, and Cesari makes it sound easy. The three other pieces are digestible workshop chips. Ein andrer Hauch is for piccolo and blisteringly high. A Small Revelation commemorates Ferneyhough’s 70th birthday. The miniature, Flourish, sets up Erber’s concerns: contrasting fast and slow material in different dynamics and articulations. “Hohler Fels.” Rolf GEHLHAAR: Grand Unified Theory of Everything (1992)1. Christopher FOX: stone.wind.rain.sun3 (1989)2. PAUL GOODEY: Hohler Fels (2013)3. Karin de Fleyt1,2,3 (fl), Peter Merckx1 (clar), Jakob Fichert1 (pno), RNCM Wind Orchestra3, Mark Heron3 (cond.). Metier MSV 28555 (1 CD) (http://divineartrecords.com/). 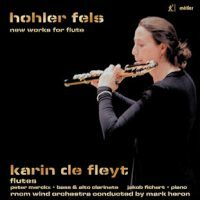 De Fleyt leads through three large and complex pieces requiring all types of flutes. Gehlhaar’s Grand Unified Theory of Everything is a quarter-hour for flute (alto and bass), clarinet (alto and bass), and piano. Inspired by particle physics and the universe’s creation, the trio unfolds in bursts of gentle near-minimal motion and acidic modernity. Repetition, expansion and contraction suggest cosmic motion and events. Fox’s stone.wind.rain.sun3 is for solo alto flute. Closely recorded, we hear half-breathed notes jumbled with delicate key slaps that altogether obscure a 16-part canon. The title and the sonic results suggest falling rain. Goodey’s Hohler Fels is an immensely dense concerto for flutes (bass, alto, flute, piccolo) and wind orchestra (incl. piano), taking its name from a German archaeologic discovery. Starting murkily, the flute navigates through smudged dissonant winds. Perhaps the piece suggests a time and place we will never know. “Hat Trick: Garden of Joys and Sorrows.” Miguel DEL AGUILA: Submerged (2013). Claude DEBUSSY: Sonata for Flute, Viola and Harp (1915). Toru TAKEMITSU: And then I knew ‘twas Wind (1992). Théodore DUBOIS: Terzettino (1905). Sofia GUBAIDULINA: Garten von Freuden und Traurigkeiten (1980). Hat Trick: April Clayton (fl), David Wallace (vla), Kristi Shade (hp). 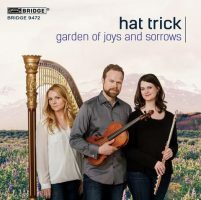 Bridge 9472 (1 CD) (http://www.bridgerecords.com/). Del Aguila’s invigorating Submerged sets the stage to boldly reconsider the familiar flute, viola and harp combo. A festive dance soon turns mysterious with the harp introducing extended techniques and the rest of the ensemble following. This Debussy Sonate reflects a new performance edition; 124 measures (of 319 total) now reflect Debussy’s original indications. We may think that Debussy was the first to combine this particular combination, but Hat Trick offers Dubois’ earlier precedent and hypothesizes whether Debussy might have known the work. Dubois’ single-movement trio is the most traditionally melody-plus-accompaniment piece on this recital. Takemitsu’s trio borrows from Debussy and functions as commentary. With its surprising Mahlerian conclusion, the Takemitsu connects with Gubaidulina. The novel playing techniques in Garten already surfaced in Del Aguila’s opener, so they surprise less, and Gubaidulina’s piece stands as a religious mystery. As a 0:37 bonus, Aine Zimmerman reads Francisco Tanzer’s poem upon which Gubaidulina’s trio is based. “Flute Vox.” Toru TAKEMITSU: Voice (1971)1. Julian YU: Sonata for flute and piano (2004)2. Edgard VARÈSE: Density 21.5 (1936; rev. 1946)3. Michael SMETANIN: Backbone (2015)4. Katia TIUTIUNNIK: The Quickening: A Tribute to Jonathan Kramer (2005)5. Mark ZADRO: Vox Box (2001)6. Reza VALI: Persian Suite (Folks Songs, Set No. 12 E) (2002)7. Brett DEAN: Demons (2004)8. Edward COWIE: A Charm of Australian Finches (1993)9. Rosalind PAGE: Courbe dominante (2006)10. Elena KATS-CHERNIN: Wedding Suite (1996)11; Blue Silence (2006)12. Gerald GLYNN: Four Episodes (2010)13. Laura Chislett1,2,3,4,5,6,7,8,9,10,11,12 (fl), Stephanie McCallum2,5,7,9,13 (pno), Thomas Jones11 (vln). 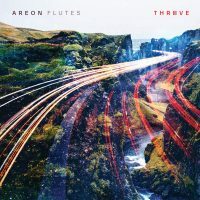 (download or 2 CDs) (https://itunes.apple.com/au/album/flute-vox/id1017645516). Chislett’s extensive program demonstrates fluency across a variety of predominantly contemporary Australian pieces. The solid program alternates between solo works and pieces requiring tape or piano accompaniment. Early on we hear Varèse’s Density 21.5 which started a new chapter for contemporary solo flute music (more than a decade before, Debussy’s Syrinx closed a chapter). Chislett demonstrates exceptional comfort with Varèse. Highlights include Takemitsu’s solo Voice which sets the stage, requiring apt but modest vocalizations. More elaborate vocalizations and techniques are needed for Zadro’s Vox Box which requires the heft of an amplified bass flute. Yu’s two-part sonata is a brisk, inscrutable essay, whereas Vali’s folksong Suite offers melody and accompaniment. Cowie’s menagerie varies solos with piano-plus-flute items. Sparked by Mayakovsky’s poetry, Smetanin’s Backbone asks Chislett to contend with a tape of flute sounds. Tiutiunnik’s homage contrasts the piano’s high range with the flute’s pitch bending. Page’s tape contributes Saturn’s radio emissions. Kats-Chernin’s Wedding Suite is an aptly named gift, played here by its dedicatees. As an extra, the pianist McCallum offers Glynn’s calming, generally single-line pieces. 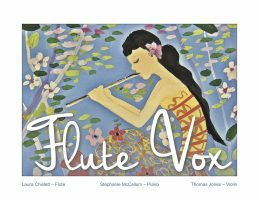 “Complete Works for Flute, Vol. 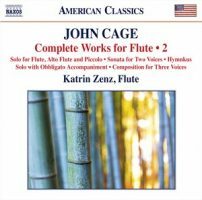 2.” John CAGE: Solo for Flute, Alto Flute and Piccolo (1957-58)1; Solo with Obbligato Accompaniment of Two Voices in Canon, and Six Short Inventions on the Subject of the Solo (1933-34)2; Composition for Three Voices (1934)3; Sonata for Two Voices (1933)4; Hymnkus (1986)5. Katrin Zenz1,2,3,4,5 (fl), Tobias Liebezeit2, Maxim Mankovski5 (vibr), Chara Iacovidou2,5, Ludovic Frochot5 (pno). Naxos 8.559774 (1 CD) (http://www.naxos.com/). Derived from the 1957-58 Concert for Piano and Orchestra, the miscellaneous Solo wanders between instruments and sound production methods. This free-for-all contrasts with the program’s remainder which despite the half-century span offers similarly built pieces. Cage unexpectedly anticipates Aldo Clementi with the canonic Webernian chromaticism of the Composition for Three Voices, and the Solo with Obbligato Accompaniment with two supporting canonic voices (piano and vibraphone). In another early piece, the Sonata for Two Voices, each voice operates in a distinct non-intersecting range across 25 pitches that do not repeat until they are all sounded. Now, who else wrote music like that? Decades later, Hymnkus employs a similar method: Its instruments operate in the narrower range of a fifth, repeating a sequence of 17 events. It’s easy to discern the repetition. Zenz has a knack for the early pieces and they are quite engaging. “Thrive.” Elainie LILLIOS: Summer Sketches (2013). Cornelius BOOTS: Chthonic Suite (2013). Mike SEMPERT: Uncanny Valley (2013). Areon Flutes: Jill Heinke Moen, Sasha Launer, Kassey Plaha (fl). Innova 955 (1 CD) (http://www.innova.mu/). This program’s first track is the most durable: Lillios’ Skating on Discs of Light, the first part of Summer Sketches, is a blustery dose of three interacting flutes that recalls Varèse’s granitic maneuvers. The trio is nicely matched. The second movement, Dry Wind, is built more conventionally despite extended techniques. The rest of the release engages less. Each movement in Boots’ Suite appears to increase ensemble size: Root of Ether is a solo, Enantiodromia is a duet, and Void of Day requires the full group. Reiteration is preferred over development. Sempert’s Uncanny Valley eventually adds electronics and unhelpful generic drum tracks before retreating.